Fiona Bruce and the experts visit the 18th-century cotton mill of New Lanark, where items include a pearl necklace and a rare cuddly toy found in a skip. Browse content similar to New Lanark 1. Check below for episodes and series from the same categories and more! in a magnificent World Heritage Site in Scotland called New Lanark. It was also the backdrop for a radical social experiment. and turned all that on its head. and his aim was to build a society based on charity and kindness. and by phasing out the employment of young children. to ensure a healthier workforce. to make his employees work harder. Instead, he came up with an ingenious way to encourage them. There was, he said, "No beating, no abusive language. "I merely looked at the person and then at the colour." in the world for children from the age of three. sharing and being kind to each other. would be allowed to work in the mill. an idea that helped form the origin of the cooperative movement. but in the early 19th century they were considered far too radical. The government was unpersuaded and rejected his ideas as crazy. have come to share their own stories with our Antiques Roadshow team. Now, is this a picture you like? -Yes, I love it very much. And where does it hang in your house? It's in my hallway and I look at it every morning. And what is it you like about it? and enjoying whatever he's doing. which you can't actually see. Unfortunately, it had been lying in a junk room. -on my wall ever since. -Now, have you any idea where it was painted? -And do you know who it's by? Well, it's a very interesting picture. and he's an artist called Mortimer Menpes. by the slip there. It's got "Mortimer Menpes." Difficult to see, that's why you didn't know. who was the American artist that painted in London. So he was one of his pupils. And Menpes went on to do a lot of travel painting. and you see his pictures in those books. and he had these specially made for him. straightaway, just by the style. But let's look at the painting. and there's a little fire going on in the background there. and they're probably making bread inside. It's a wonderful, wonderful picture by him. And it's got a value. Thank you. That's very nice, thank you very much. you can have that gently repaired. But it's a wonderful piece. Yes, you've made my day. Thank you. Now, someone told me that you were the first in the queue this morning. Half past six this morning. So what time did you get up? Well done you. You've come a long way, then? I have travelled a long way, it took 12 hours to reach here. What? Where have you come from? I must admit when I first saw him, I thought he was a wasp. -But he's not, he's a bee! Tell me the history of him and how you came to have him. -and this was thrown in the skip. I love it. How could they throw him in a skip? I know, he's gruesome, but in a nice way. He's in such good condition. -I have looked after him. So you didn't take him to bed and squeeze him, because he's got wings. -I was tempted when I was younger. -Yes, I bet you were. But I managed to refrain from doing that. in the '20s and '30s. I mean, how could people think up these wonderful names for things? -So, he's made of sort of plush, which is a mohair plush. which, I think, are sort of wired muslin. Yeah, there's a lot of work in it, isn't there? the size is remarkable too, they're huge. They are quite big! Are they usually smaller? Well, they come from my husband's family. so that's where they came from. So you chose these because...? and all kinds of things that I had to have fixed. -Oh, you had them restored? Because everywhere you look there's more detail, isn't there? -Every hair is carefully painted, one little line at a time. -And I love this lace. or they've made it look like that in the ceramic? -and then they stuck it on the figure. -leaving its skeleton in china. And it goes right the way round. The lace dress... Look at this trim there. -That dress is beautiful, isn't it? all there, every little piece of lace, so delicate, isn't it? I mean... So, Meissen was the greatest of the German factories. but they never did it so well. If one can lift up the weight. And this is a sheer sign of the Meissen, because it's the weight. and that shape of mark is right for about 1870, something like that. Was it expensive repairing them? I think altogether for both it was about £500. -So quite a bit to spend on them. Was worth having them repaired, then. Well, two of the most exuberant armchairs I've ever seen! Oh, I absolutely love them. -The owner of the house, he collected a lot of Burmese artefacts. And then after that, they were stored in a garage. OK. What prompted you to approach the Roadshow with them? Now you... Invited to the king's palace? and we were invited along. "I can't believe we've these two chairs in the garage!" And he said, "No, you must be mistaken." that we should look at these mythical animals. the fabled hairy-tailed giant turtle. which flows into a stream. On top, we have a crane. There's its beak and its head. but this wing comes beautifully over the top of it. And can you see its sprawling leg? Very well observed, as the Japanese always do. which are associated with rain and rivers. -So, I mean, what a coincidence. I know these are actually from Japan. -..at the end of the reign of an emperor called Meiji. -The king's chairs, they're probably Japanese. must have got something Japanese. late 19th, early 20th century, it's gone. -which I'm going to give you. -who may think even a little less than that. whether they go back into the garage or what, I'm not sure. -And that is pretty good, isn't it? that you're not from the UK? And is this something from Germany, or where did it come from? It belongs to my husband, really. He can't be here today, so he asked me to come. And he bought it somehow in 1994, on a flea market in Hanover, he said. You're joking?! This was found in a Hanover flea market? Did he ever tell you what he paid for it? Well, he said about 100 marks, German marks, those days. About three marks to the pound, was it? I don't really know, but if you say so. -I spent a lot of time in Berlin during the '80s. and I never found anything like that for the equivalent of £30. So he was very lucky? Anyway, let's have a look at it. It is what we call a strut clock. And there is the stamp of the retailer, which is London & Ryder. So we'll just shut that up momentarily. to support the clock, or we can lean it right back. is something that I know was made by one specific man. -it was made by a man called Thomas Cole. Typical Cole dial, beautifully engraved, as I say. You've got roses and I think what looks like fuchsias there. New Bond Street, London, who were one of Cole's retailers. -another famous company, Hancocks, of Bruton Street. And this is a very, very serious size of clock. ..which you only see when the strut is swivelled round. and we're talking, this is probably around 1860. And your husband bought this for the equivalent of £30 to £35? Fully signed, fully numbered, with its box. Yes, I would be happy! never found it, so all credit to you both. ..in the prisoner of war camps. -with regimental badge and with his pipe? Who was he and is he a family relation? of the Queen's Own Cameron Highlanders. Stalag B prisoner of war camp in Germany. and the diary give a very personal account of his time in Stalag B.
which was hidden inside a Bible. -This is the camera in the hollowed-out Bible. Point the Bible in the right direction. And I have a few smaller pictures. That's really interesting, there's some pretty senior German officers. you can see them getting into their transport there. They wouldn't want to be photographed. You don't know, it might have been a senior officer visiting the camp. -Certainly something that he didn't want snapping. -as the Germans liked to let on was being served to them. So, again, that would be potential propaganda if that got out. he would be looked up to. Let's look through the diary. one of the other prisoners dressed up as a lady. I've never seen this many photos from a prisoner of war camp. -living daylights out of each other in friendly competition. to the smiling kid, who is a Dutchman. And we're not told who won, but my money's on Mr Jones. "March past of all nationals." And, "The camp commandant takes a salute." ..and the Hollanders. So there's obviously Dutch prisoners in there. of prisoner of war memorabilia that we've ever had. Things like this, they don't have a tremendous commercial value. 200 or 300 quid for it, that's not very much. -..you should tell his story. Yeah, I think I should, there's something can be done with it. -I can see a book in this lot. -Yeah. Thank you very much. -This is what I'd call a large table, even a very large table. -It's made of solid oak, but with a huge great marble slab. How on earth did you get it here? up in the bedroom or something? I eat my dinner off this. work out what I think it is. Do you have any history at all? I don't have really a lot of history at all. I bought it maybe about ten years ago from a dealer friend of mine. and it looked really Gothic, and I needed a table for my kitchen. And I had a really small in there, so this was perfect. -for perhaps game or for cold meats, something like that. and things like that on it. I don't know, that sort of thing. That would make sense to have this big marble top. -It's not made as an eating table, anyway. get your legs underneath it so you have to sit a little bit funny. so the carvings are all on the front here, this wonderful carving. slender going up like that to these crocketed finials at the end. That is so typical of the Gothic period. From the early Gothic to the Gothic reform, it's almost the hallmark. But if you go from the back here, you've got a rose. I don't know if it's a Scottish rose or not. and then we move to... Oh, shamrock. Ah! so it's intricately carved, it's really beautifully carved. a big Scottish, possibly Highland castle, like Taymouth. but I think I'm right because it was remodelled several times. was the very young, at that time unknown, Augustus Pugin. -If you like Gothic, you must have heard of him? He's better known for the interiors of the House of Commons. He is one of England's great architects. but as a workman or drawing. I mean, nothing particularly important. -imported marble from Italy, so no expense spared. So we have something which he might have seen, he might have touched. so we're getting a nice provenance, possibly, but we have to prove that. ..pretty good piece of furniture. I think £15,000 to £20,000. Oh, my goodness. Oh, no! Now I'm going to feel very guilty if I have a curry on it. Did you steal it or wheedle it out of the chap? dealer for £600, and he says, "Oh, you've been ripped off." So I guess I haven't, actually. -You bought what you liked and it's paid off. Brilliant, great, thank you very much. who was German and he was married to...? So that's not a particularly easy situation in the 1930s in Germany. -I should point out that you're father and daughter? This is Heinrich. This is my great-grandfather. -and also the Knight's Cross for bravery. it was not possible for them to be together. So the decision was made that they would need to separate. So their marriage came under scrutiny, did it? They had to divorce, I understand. ..her family came to... came to the UK. -He was left behind, yes. -so that she could get to safety? to be honest with you. Something that had to happen. So your father, along with his siblings, came to Britain. He then took part in the Second World War? -Of course, he was German. -Did he admit to that? He would say he was Scandinavian. that Dad wasn't even told about his origins. and had no idea what it was and asked questions about it. so there was little or no evidence of the Germanic history there. And do you think he felt a sense of shame about his heritage? he said he's ashamed to be German. ..which we're going to look at. That's the one thing she gave me after her death. and there are a few gemstones that are red in colour, as well. how did you get to have this? and she's now passed it on to me. So don't really know anything about the bracelet, at all. When did you receive this? Just about a year ago. And have you worn it? -And what did you feel when you were wearing it? that's why my mother gave it to me. Do you like the colour red? But what do you think the stones are? Well, my mother seem to think it was garnet. And that's a red stone. and they have all different types of red. and you also get rubies. Now, why my heart sung where I saw these is because they're rubies. ..from Myanmar as we know now. where rubies have come from for the last 800 years. and that's what you're looking for, the intensity of colour. that sort of period is when it was made. Oh, goodness, that's a lot. A very plain green dish. And how long have you been aware of this dish? but, I mean, it's been in the family probably over 100 years, I imagine. Over 100 years. And how do you know that? Er, because it's in some very old photos of a very old house. so we're only going back into the second half of the 19th century. We've got to go back to, let's say, 1480. -Of anything in the house. -..of ceramic in your house. And it's certainly the oldest piece I've seen today. Now, this colour is celadon. -..liked this sort of thing coming from China to him. in the 17th century who wore a coat of many greens was called Celadon. I'm going to turn it over and show you where it's not green there. of the saggar in which it was fired, the box in which it was fired. -which they could then put in the kiln like that. And it wouldn't stick. So that's why that's there. and they specialise in these things. They exported them all over the Asian archipelago. It's a lovely thing. It's a little bit worn. It stands where in the house? It's just kind of in an alcove. -In an alcove, hidden away. Wow. Pretty good for what I consider to be a flan dish. Good. Good, I'm glad you like it. -and your grandmother coming over here? And did the whole family come over? my grandmother and my aunt, the three of them. And this picture came over with them? are there things in this picture that you still have? Unfortunately not, I don't recognise anything. But this was the interior of the house in Germany? -And where was the house in Germany? It's a fantastic memory of what was there. that there is a little bit of damage here, what actually happened? Prince's Gate was bombed, as my daughter's saying. -from that period so when it came out, it had to be restored. you put the canvas onto another canvas. They wouldn't have had the materials. I'm going to have to try to get my head around this. And it's 1923, so this is a record of the family house in the 1920s. What does it mean to you, having this picture? I think it's fantastic to have some sort of memento, to start with. since wartime, you know what I mean? I've never been over there. -be able to have a memento. of course that was bombed so the house wouldn't be in existence. That would have been lost completely, as well. it's very nice to have a memory of that house in Germany. -and it's such a nice thing to still have. Could do a little bit of a clean. -Yes. Just a little bit. whether to leave it as is or whether to clean it. Possibly a new frame, as well? I don't know. No, the frame is contemporary with the period. Very nice to see and it's nice to have that memory really of the past. I've always wanted a musical box like this. Then you'd want an aunt like mine. Your aunt gave it to you? She did indeed, yes. About three years ago. and it was her father that purchased it for her. And it's second-hand from Switzerland, round about the 1920s. So he was in Switzerland? I believe it was one of his work colleagues. -that had brought it back for her. Well, you probably know that this is all inlaid wood, various woods. rosewood. It's veneer, rather than solid. had a musical element of the design in them. So you know that it's a musical box before you even open it. Oh. Look at that. Look at that. Now, what it... It's actually called Drum, Bells & Castanets. And to me that is everything. which hasn't got any extras. you've obviously kept it very well. I have to tell the truth and say, no, my aunt kept it very well. but if this was by Nicole Freres it would be plastered on there. He would be, "I am..." You know, he'd put his name on it. which is Vaucher Fils being sons. But as they haven't got a name on it, it's one of those anyway. you probably wouldn't get more than about £2,000 for it. But if you were buying it, you'd probably have to spend 4,000. Right. Gosh, that's a lot more than I expected. So have you got a favourite? which is one of the wonderful waltzes that is on it. So shall we play it? over the course of time. Is it yours? "Joanne is a grocer girl." Do you want to read that to me? "So she can keep her figure." That was written by one of my friends. -Friends with Agnes? Yes, yes. Lovely. So, yes, it's full of that kind of thing and very nice too. -this is signed by Hugh MacDiarmid. -He's one of the most important 20th-century Scottish poets. I took my autograph book and went with the groceries. about how he didn't do these kind of things. "Give me it," and he wrote me this poem and he put the date. Probably wasn't the most approachable of men, was he? -He was quite old by then? An important national poet, but also politician. So involved in Scottish Nationalist politics. He was what I'd call a grumpy old man. Anyway what did he write? Please, I would love it if you could read it to us. "The Little White Rose Of Scotland. "That smells sharp and sweet and breaks the heart. It's very moving, isn't it? I think you did fantastically well to get that, but also to keep it. This isn't an original poem. This is one of his published poems and a well-known poem, as well. It's got a commercial value, of course it has. I get to record with a Shippam's fish paste pot. -and we found the pot. -This is living history, isn't it? and that's my job. I love it. And this one takes me back to my childhood. That call, "Andrew, Andrew, tea is ready." And you'd say, "What is it?" And she'd say, "Shippam's fish paste." and slimy, what fun, I mean, its value is infinitesimal. and that for me is what history's all about. Here we are by the banks of the Clyde. I'd have a bit of a brighter expression than her. I don't know. She does seem quite miserable, doesn't she? -Have you known her for long? so I sort of said to my aunt, "Oh, there she is!" My aunt said, "Take her," cos I love her, I've always loved her. Does she have a name, it sounds as though you're quite attached to her? she's just sat there and gathered dust. Well, you call her Fish Lady. or in fact actually Madame Dauphin because it's a dolphin. She's sitting on a dolphin. but look how one of her feet is actually in the water. Oh, do you know what? I'd never noticed that before. The wave is actually modelled across there. So she is French, we just need to date her now. She was made near Nievre in about 1720. -So that just comes to what it's worth. -So you found it on your auntie's windowsill? it would make between £800-£1,200. -So she's quite pricey fish lady. The pearls were bought at a car-boot sale for £2. And when did you buy this? was the fact they had the little chain on them. you have a little chain put on it. about the lustre, it really is. and you can see your hand waving back to you. And also it's size - size is important. that is where your money's in. I think that these could be natural pearls. you never would have given £2 for it. No, it was the chain that I noticed. I thought someone valued the pearls because they've put a chain on them. -for producing things I've never seen before. And I've never seen anything quite as confusing as this. It is confusing, you're right. and that was passed on then to our father and now to us. So the names on this don't mean anything to your family? -So it is something you've acquired? -Do you know where this is from? Yes, I've been down to Stickland. Or do you mean originally? Although it has an eastern panel around the outside. with anything but Sri Lankan symbolism on it. That's obviously the parish church. It is. I've been there, yeah. And then it says church and rectory, Reverend W Churchill. 13th February to 12th November 1884.
started his pious work in this village church. and it was probably made as a goodbye gift. -Because this is obviously the end of his service there. -I don't think that's his death. -but of course we don't know. because these elephants, they're not Dorset elephants, are they? -I mean, the extinct Dorset elephant. -with a Latin inscription that says, "Esse quam videri." "To be, rather than seem." I'd probably pay as much as £300 for it. as it is this cross pollination of cultures right there. -It is fascinating, it really is. This is such a great toy car. He would have been about seven, so about 43 years ago. And she bought it at the jumble sale. and came back with a car for him, so he was quite delighted with it. I bet he was, presumably just bought for a few pence. nothing would have gone for a lot of money there. -Well, no. No, it wasn't. He got it and he played with it. and it was up and down the street and he had a lot of fun with it. I suppose an object can only give once and it's already given. -It has given a lot of pleasure to your husband. Let's just have a look at how beautifully made it is. First of all, it's modelled on a real car. It's modelled on an Alfa Romeo racing car called a P2. So it's known as the P2 Alfa. And just look at the detail. the tyres, they're proper cast tyres, they say Michelin on them. The exhaust, the handbrake, the actual proper usable steering wheel. to wind up the clockwork. Not seen on the full-size vehicle! It was made in France by Compagnie Industrielle du Jouet, CIJ. And the P2 Alfa was the car of the moment. and it was the Formula One car of its time. and red and blue and the orange one is an unusual one. who would have owned this in the 1920s. He would have been from a good family. and would have been completely over the moon. and has it been passed down through the family or...? so he enjoys it, thinks it looks quite cool. and I was very excited whenever saw one of these, as a result. and one sold for £12,000. So that has now made me completely rethink the value of this. was in perfect condition, original condition. and it won't worry some types of collectors. the regular price and put it somewhere in the middle. Well, he never expected that, not at all. And is your son still going to have it? Thank you very much for bringing it in, it's been a real treat. I'll get it back in the bag. we have been accompanied by the roar of the River Clyde. it was a bit of a tourist attraction, as well? as he describes it, and to the Falls of Clyde. of the river here with you. "which gradually becomes louder and louder as you approach the fall." From New Lanark and the whole Antiques Roadshow team, bye-bye. 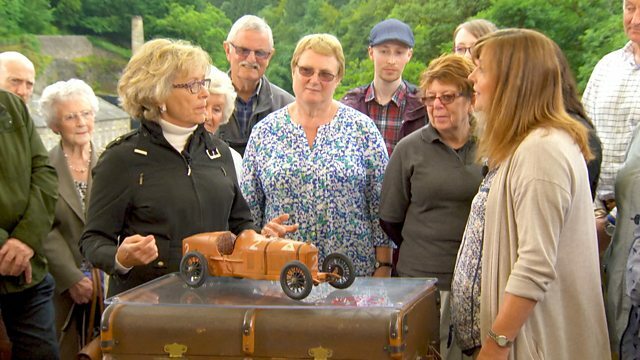 Fiona Bruce and the experts head to the banks of the Cyde to meet visitors bringing family heirlooms to the 18th-century cotton mill of New Lanark. As evidence that you should never throw anything out, treasures featured include a pearl necklace bought cheaply at a boot sale, a valuable clock found in a flea market, and a rare cuddly toy found abandoned in a skip. Plus there is a moment of disquiet when a guest reveals how a family painting is a reminder of an uncomfortable family secret that dates back to the days of Nazi Germany.